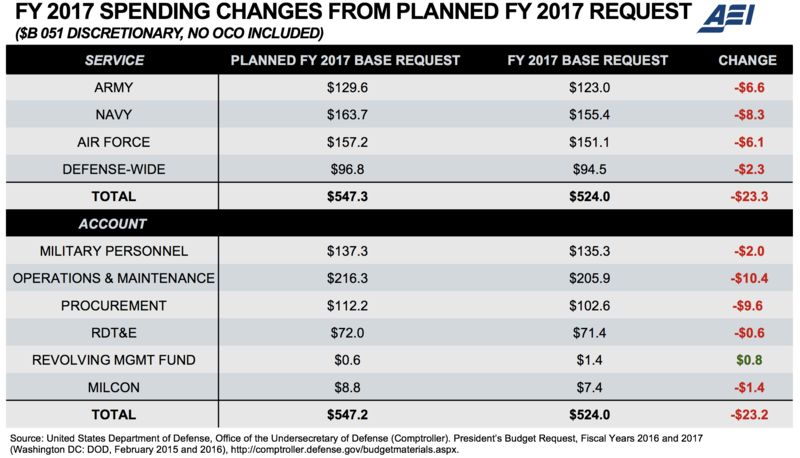 President Obama’s fiscal year 2017 defense budget request (FY17)[i] totals $610 billion: a $551 billion base budget combined with $58.8 billion in overseas contingency operations (OCO) funding, or emergency spending above the legal budget caps. The president’s final budget is at least $18 billion short of his own request from last year, setting up both parties for yet another political fight over the defense topline on Capitol Hill. Worse, inflation means the latest defense budget is actually declining—not rising—in real terms. 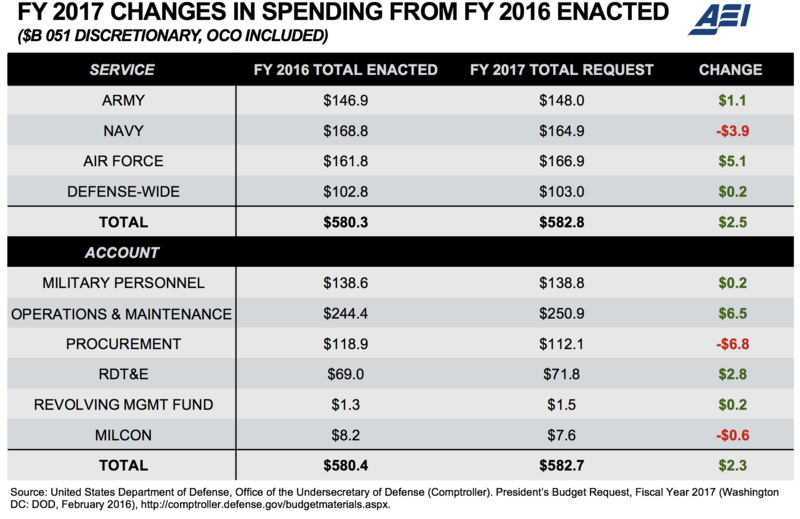 In sum, the president’s 2017 defense budget cuts more than it invests. The bottom line is that even though investments in cutting-edge technologies are necessary, the continued reduction to the size of the military and heightened cuts to procurement far outweigh any new growth. Additionally, Secretary Carter’s offset investments are paid for by procurement reductions not only in 2017, but also throughout the entire five-year Future Years Defense Plan (FYDP). Given the gap between Mr. Obama’s planned request and the actual 2017 request—plus the new requirement to pay for needed technological leaps—the budget’s bill payers are many. 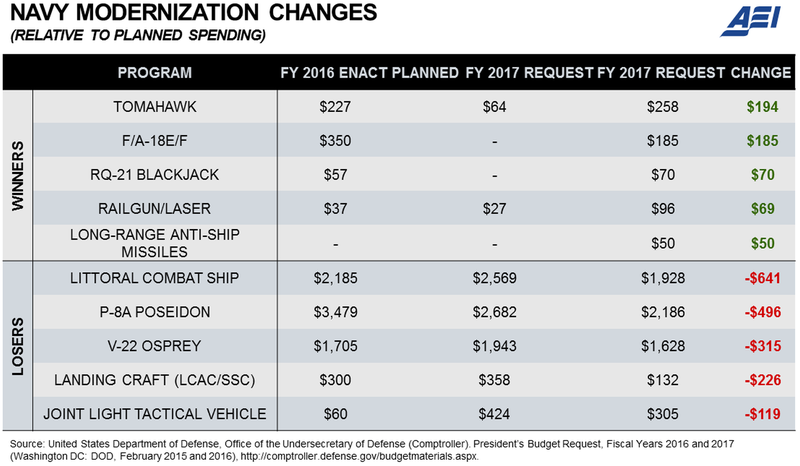 They include Navy and Army aviation programs, Air Force bombers and airlift, and many small reductions spread across hundreds of line items in the modernization accounts, including procurement and research, development, test, and evaluation (RDT&E). 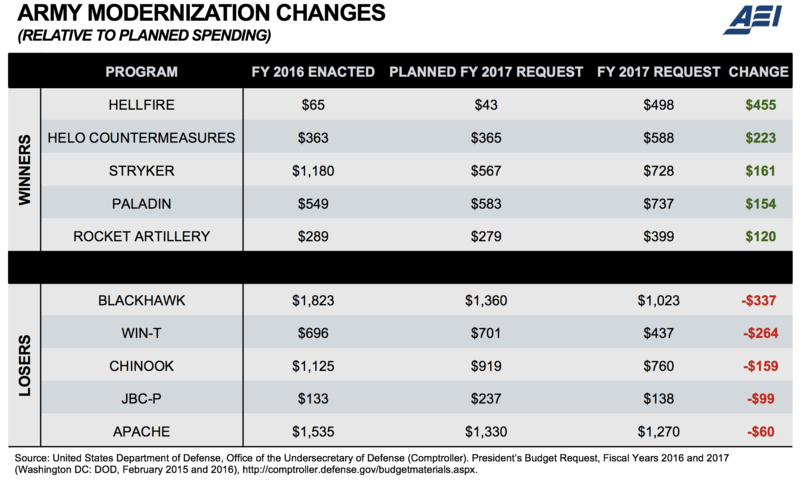 Proposed future spending changes little, remaining $113 billion above the existing Budget Control Act caps from 2018 through 2021 and $425 billion below the level of spending anticipated by Secretary Robert Gates in 2012—the last realistic budget prepared by the Pentagon. While artificially low for political reasons, the 2017 defense budget request provides appropriate building blocks upon which the next administration will need to expand, including growing credible US military forward presence in Europe and restoring the US military’s technological edge. There are downsides, however. The European reassurance plan is merely a Band-Aid on the gaping wound of accrued short-term risk with which commanders must contend. Legacy programs and capacity continue to take hits. The services still do not envision achieving full readiness until 2020–2021 at the earliest. The 2017 defense budget has additional problems. Defense leaders made many rosy assumptions that overleverage the Pentagon’s balance sheet and paper over the real reductions and consequences by making them seem less harmful. Yet if these expectations do not pan out, Congress will need to find billions of dollars more of further savings in the appropriations process. This would make congressional Republicans’ effort to match the president’s total planned defense budget request from last year for this year that much more difficult. This is because, to close its $15 billion deficit in the main defense budget, the Pentagon not only shaved more than $5 billion using optimistic assumptions about the economic outlook and fuel prices, but also cut expected procurement by $4 billion in the Navy, $3.5 billion for the Air Force, and $2 billion in the Army—all reductions that Congress will strongly resist. 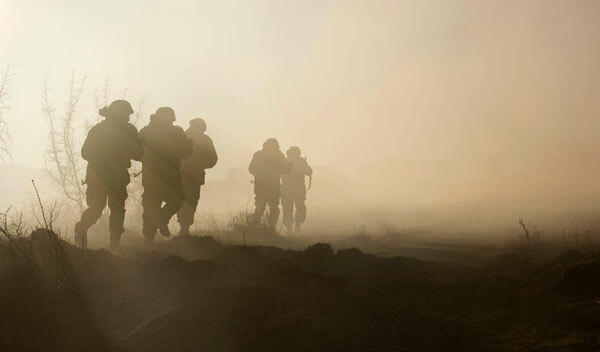 The budget also shrinks the personnel rolls of the Army by 15,000 soldiers and Navy by 4,400 sailors, while once again shifting large amounts of readiness funding from the base budget to war funding accounts. There are many ways to compare two years of defense spending. One popular choice is to relate the president’s 2016 request[iii] with his 2017 request side-by-side. This simplistic look does not reveal the internal priorities of the Pentagon leadership, trends in internal spending, or the involvement of Congress. For this paper’s analysis, the actual budget request from 2017 was compared with both the 2016 enacted budget and the planned 2017 request from the president’s 2016 request. This approach allows policymakers to discern internal Pentagon priorities while also accounting for congressional intent and involvement. Overall, the winners and losers of this year’s budget were mixed, with the possibility for a significantly different outcome after Congress weighs in. The one area of agreement, however, is that both Pentagon leaders and congressional members agree the total defense budget is too low to meet current requirements. How to fix that shortfall, however, is anything but clear at this point in time. In the words of one defense official, the Pentagon’s 2017 budget is filled with the same shoddy accounting that Enron and Lehman Brothers used before they both collapsed: taking on too much risk, banking money before “reform” efforts actually manifest savings, laden with optimistic fuel and economic assumptions, and carrying items “off the books” in the hopes of more money in the future. 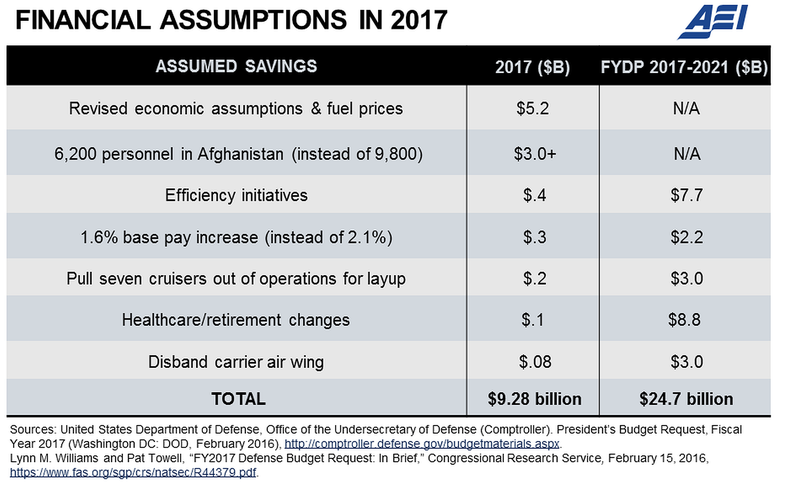 In total, the bean counters assumed $9.4 billion of tenuous savings in 2017—money that will come out of already stripped procurement accounts if the savings do not materialize on time or are rejected by Congress. The budget includes $400 million in efficiency initiatives that traditionally have not paid expected dividends. The budget’s 1.6 percent base pay increase for the military may be bumped up to 2.1 percent by Congress to meet private-sector wage growth. The projection of only 6,200 personnel in Afghanistan next year could also leave the Pentagon short by more than $3 billion if President Obama or his successor decides to expand the mission. The budget’s proposed cost savings in Navy force structure already face criticism in Congress. Politicians are no more likely to support increased copays and health care contributions at suggested levels in a presidential election year, and they will push back yet again on a future base closure round. The rate of utilization for Secretary Carter’s new maternity leave and cryogenics policies could far outstrip paltry usage and financial assumptions. Commissary changes will likely not materialize. 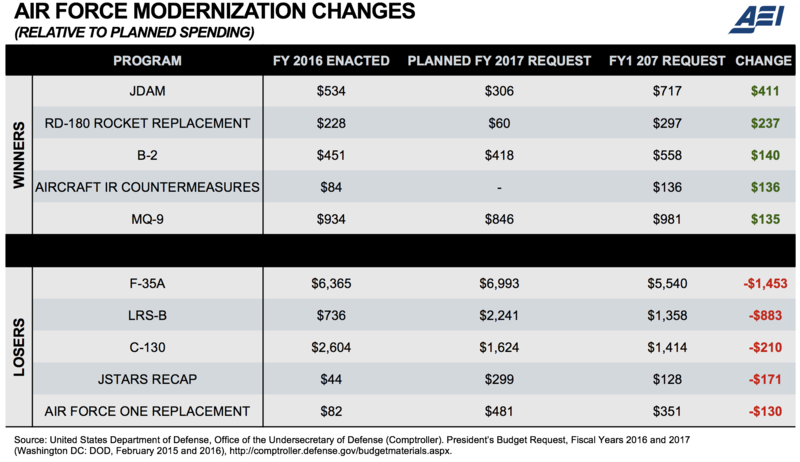 Finally, Congress will certainly oppose the Pentagon’s cost-saving modifications to the blended retirement system signed into law just last year. The Army’s budget contains few surprises in 2017, with active-duty end strength continuing its slide while aviation, networks, and facility upkeep all take hits. The Army continues to buy back readiness at near-maximal rates, however, and the budget establishes a new rotational armored brigade and armored equipment set in Europe. On top of a $370 million slice to its Warfighter Information Network-Tactical and Joint Battle Command-Program command and control programs, the Army essentially delayed procurement in its entire aviation portfolio. In FY17, the AH-64 attack helicopter loses five helos from FY16, the Chinook drops four airframes, and the Blackhawk program is reduced by a significant 24 helicopters. Despite the delays in aircraft purchases, the rotary-wing portfolio sees $223 million in accelerated spending on infrared countermeasures to defeat advanced surface-to-air missile threats. The Army’s Stryker program receives a hefty $160 million acceleration on top of its boost by Congress in 2016. The Army starts new efforts for two of its airborne brigade vehicles: the Ground Mobility Vehicle and the Mobile Protected Firepower light artillery vehicle. In emergency funds, the Army buys 12 extra Paladin A6 artillery upgrades in FY17, adding to the program of record, and accelerates long-range precision fires in several other programs. The rest of the vehicle portfolio stays roughly on track. Navy leaders tried to protect core shipbuilding programs by keeping Burke-class destroyers, Virginia-class attack submarines, Ohio Replacement Program ballistic missile submarines, Lewis-class oilers,Ford-class carriers, and Marine Corps amphibious assault ships all on track. The Navy funds these and new investments by eliminating a carrier air wing (saving $3 billion over five years), laying up seven more cruisers (saving $3 billion in five years), ditching 12 Littoral Combat Ships (saving $641 million in 2017 alone), and shuttering its Unmanned Carrier-Launched Airborne Surveillance and Strike (UCLASS) program in favor of a much cheaper tanker variant (saving $300 million in FY17). Critically, all four assumed savings will be sailing into significant congressional headwinds. Both the MQ-4 long-endurance intelligence drone and the P-8A antisubmarine aircraft received an extra airframe last year, so the Navy saves immediate cash by delaying one of each this year and pushing five more MQ-4 Tritons beyond the budget timeframe. Legacy programs continue to be negatively affected. The Navy also delays V-22 Osprey and MQ-8 Fire Scout helicopter deliveries throughout the Future Years Defense Program (FYDP) to achieve savings. More surprisingly, the budget shrinks both the Navy’s legacy Landing Craft Air Cushion hovercraft and Ship to Shore Connected hovercraft replacement programs. Naval aviation gains two war-funded F/A-18/E/F Super Hornets in 2017 and plans 14 more in the 2018 base budget. The Navy successfully fended off Secretary Carter on its F-35 program by avoiding a procurement increase in FY17 and pushing most of Carter’s directed increase of 10 F-35C variants into the future. While the Navy cut even more deeply than it spent on innovative investments, there are new and accelerated programs with an eye toward the future. Four anti-ship missile programs are accelerated: Tomahawk Block IV, the SM-6, Long-Range Anti-Ship Missile, and the Offensive Anti-Surface Weapon. Despite the high-profile cancellation of the 2019 railgun test on a Joint High Speed Vessel in this budget, the Navy invests in a bevy of Carter’s Third Offset priorities in all five focus areas, particularly acoustics and unmanned undersea vehicles. The Marine Corps budget maintained its balance from earlier years, focusing on readiness and once again privileging its aviation programs over vehicles. Force structure is static, although Commandant General Robert Neller has hinted at the need for extra Marines to fill cyber and information warfare billets. The Marine Corps adds two F-35B Joint Strike Fighters in 2017, which follows an extra six airframes from Congress in 2016—and then another in FY21. The Marines’ F-35B program is maxed out. While the F-35B was accelerated once again and the KC-130J and CH-53K remained on track, the Marine Corps lost 70 Joint Light Tactical Vehicles in FY17 and delayed both of its legacy vehicle modernization programs to keep the ACV 1.1 amphibious vehicle on schedule. Of all the services, the Air Force’s 2017 outlook is the most mixed. All of its procurement accounts shrink—except space—to pay for a large uptick in research and development (R&D) spending over last year’s enacted budget. Readiness spending improves, but the Air Force actually projects a decrease in flying hours in FY17. Primary Air Force bill payers are the F-35A Joint Strike Fighter program ($1.45 billion total saved in 2017), the new bomber ($883 million short of last year’s request), the C-130J program (seven airframes pushed out of five-year budget, including two to save $210 million in FY17), and retiring 20 airframes from the C-130H tactical airlift fleet. The Air Force also saved $300 million this year through new acquisition strategies for its Air Force One replacement and Combat Rescue Helicopter. The Air Force left open the option for an F-35 multiyear procurement in its projected funding for 2018 and beyond. The KC-46A tanker stays on track despite program delays, and the legacy upgrade programs for the F-16 and F-15 are delayed in some places and accelerated in others. The budget also keeps the A-10 Warthog close air support aircraft, EC-130H Compass Call electronic warfare aircraft, and the U-2 spy plane flying. The Air Force also had to pony up for the critical Operational Control System, which controls the GPS constellation, to cover $200 million in cost growth and fund $100 million in modifications to the existing control system so that they can at least talk to the new GPS III satellites. In better space news, the Air Force takes a cue from Congress on the RD-180 engine replacement, adding $250 million for research in FY17 and $1 billion over five years to ensure the production of a new American rocket engine. The Air Force shifts its entire MQ-9 Reaper drone procurement ($450 million of FY17 spending) to the war account, although it also sought savings by downsizing the program of record by 14 aircraft later in the FYDP. The Air Force presses hard to revitalize its remotely piloted aircraft force, funding double the number of drone pilots, keeping a training station open, and delaying the retirement of two MQ-1 Predator squadrons to maintain its required 60 combat air patrols. The Air Force also saw a shift in research and development spending. While its research budget took a slight hit from planned spending, the $900 million reduction to the new bomber freed the service to reinvest the money in offset-inspired developmental spending. As in the Navy, Air Force R&D accounts receive many “new start” programs and significant accelerations, particularly in aerospace propulsion and space control technology. The OCO request contains few surprises as a whole, although it includes some interesting programmatic requests that further weaken the rules meant to constrain abuse of the account. The war supplemental request of $58.8 billion includes $42 billion for Operation Freedom’s Sentinel for the conflict in Afghanistan and the minimal US ground forces presence in the Middle East, $7.5 billion for the war against Islamic State in Iraq and Syria, and another $600 million for training Iraqi security forces. Congress will reject a similar request of $300 million for the Pentagon’s abject failure to train Syrian rebels, and the $1 billion Counterterrorism Partnership Fund Request will likely be raided, as it was last year. The largest change in the supplemental budget comes in Europe, where spending quadruples to $3.4 billion to preposition an armored brigade combat team (ABCT) equipment set and keep another ABCT on rotation in Europe. This has serious procurement costs. For example, the Army spends more than $300 million to buy a new fleet of medium and heavy tactical trucks. This account also pays for accelerated munitions spending—from Hellfires and Mavericks to Small Diameter Bombs and JDAMs—and a very significant investment in aircraft countermeasures that underscores concern over advanced surface-to-air systems. There are some less explainable “emergency” spending choices, such as the Air Force’s decision to move $450 million in MQ-9 Reaper funding to OCO and the Army’s choice to fund 12 Paladin artillery upgrades with non–base budget money. In the 2017 defense budget, concerns over declining US military technological supremacy across services and domains are clearly a priority over rebuilding the atrophied capacity of forward forces for assurance and deterrence. Warfighting is at a premium in the president’s last budget, despite commanders wanting both near-term mass and long-term advantage over adversaries. With the budget coming in $18 billion short and diverting funds to next-generation programs while employing rosy economic assumptions, the outcome is an either/or proposition with consequential tradeoffs. Even with Congress adding back into the budget, it will not be enough to fully achieve restoration of both capability and capacity. Yet if the next administration will lead in finding a long-term fix to the Budget Control Act, its Pentagon leadership will know where to invest needed additional money to rebuild the US military. [i] US Department of Defense, Office of the Undersecretary of Defense (Comptroller), “DoD Budget Request,” Fiscal Year 2017, February 2016, http://comptroller.defense.gov/budgetmaterials.aspx. [ii] Mackenzie Eaglen, “What Is the Third Offset Strategy?” Real Clear Defense, February 16, 2016, http://www.realcleardefense.com/articles/2016/02/16/what_is_the_third_offset_strategy_109034.html. [iii] US Department of Defense, Office of the Undersecretary of Defense (Comptroller). “DoD Budget Request,” Fiscal Year 2016, February 2015, http://comptroller.defense.gov/budgetmaterials/budget2016.aspx. This article originally appeared at the American Enterprise Institute.